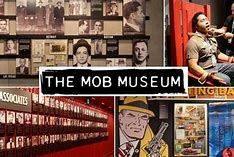 The Mob Museum offers a bold and authentic view of organized crime from vintage Las Vegas to the back alleys of American cities and—increasingly—across the borders and networks of the entire world. Explore the real stories and actual events of Mob history through interactive exhibits and one­of­a­kind Mob and law enforcement artifacts found inside our restored 1933 former courthouse and post office building. Those in attendance will split up into groups of 8-10. This interactive workshop will open new possibilities to describe organized crime and law enforcement in both ASL and English. This will include touring each floor of the museum while identifying and demonstrating the history, concepts, and names into ASL and English. This will be a great workshop! Come see your colleagues and friends while you add or brush up on skills in your interpreting toolbox. Please note that refunds will not be given for this workshop due to the circumstances of where the workshop is taking place.